Indian Sign Language Research and Training Centre (ISLRTC), how did it establish! I will tell you about it. Planning Commission was set up in India in 1950, nearly 50 years back. Planning Commission has had blind and orthopedically challenged people but never a deaf person. The Disabled Rights Group, headed by Javad Abidi kept advocating with the Planning Commission that deaf people should also be involved but the request was not accepted. Disbled Rights Group along with NAD protested outside the Planning Commission Office and then the Planning Commission accepted it. But we did not see any progress in any sector for next two years. Disabled Rights Group and NAD on 3rd December 2009 held a protest out the Planning Commission Office and it was conveyed to the Planning Commission that they have not been responding to our letters from past 2 years and presented our 5 demands. It was difficult for them to fulfil all so they asked us to choose one. We chose ISLRTC. In 2010, the finance ministry approved of it and a budget of Rs. 44 Crores was allocated for the same. We had gotten this for the first time in history, we were very happy. With time Ministry for Social Justice & Empowerment took a decision to move ISLRTC to IGNOU. IGNOU was administering it. The Vice Chancellor was replaced with a new one. He was not very considerate about ISLRTC. The responsibility of ISLRTC was given back to Ministry for Social Justice & Empowerment. NAD demanded ISLRTC to be an independent body and they promised us the same. Even when the new BJP Govt. had come in, we requested it be an independent body. The Department of Empowerment of Persons with Disabilities decided on moving ISLRTC to NIHH and it was event sent to the PMO, we had no news about it. We started filling RTI to know about ISLRTC’s status and the response was the same that they are moving it to NIHH. NAD team tried to meet the minister to get it autonomous but it had already been decided by the PMO. NAD invited its leaders from all parts of India on 15th March, 2015 and discussed if it should be autonomous or we should let it go to NIHH. Everyone wanted it to be autonomous started writing letters to the PMO but there was no response. We decided on having a protest on May 5th, 2015 outside Shashtri Bhawan Gate No.4, New Delhi. 3000 deaf people gathered there demanding that ISLRTC must be made autonomous. Minister for Social Justice & Empowerment advised us to meet the PMO. We stopped the protest. Two days later the leaders , Sibaji Panda, Vice President from All Inida Federation of the Deaf, Uma Kapoor, General Secretary from All India Foundation of Deaf Women, Zorin Singha, President from National Association of the Deaf, A S Narayanan, Secretary from National Association of the Deaf and Surender Randhawa, PhD went to meet Shri Jitendra Singh in the PMO. He listened to our plea and agreed to support us. Press Information Bureau (PIB) clearly stated that the deaf want autonomous ISLRTC. There was no response for two months. We kept following up and sending letters to different MPs and Ministers. On 22nd September 2015, ISLRTC was made autonomous by the PMO which perfectly matched with the International Week of the Deaf Celebration. God bless them! The deaf are really happy with this first victory. We hope to work more and more in future. I am A. S. Narayanan, President of National Association of the Deaf. Now I tell you news. You know about the International Day of Sign Languages declared by United Nationals (UN), New York on 18 December 2017. I want to inform you that I met the Government officials recently. I proposed that International Day of Sign Langauges 23 September for the Government to progress and take initiative on it. The Government official said it is better to send letter regarding that to Prime Minister office, Ministry of Social Justice and Empowerment and your State Chief Ministers and Department of Social Welfare. When all states give approval. Then it is possible for the Government will give recognition to 23rd September as International Day of Sign Languages. Now I request you all Deaf Indians to support your own sign language. You must accept and support this! I request you to use the ready-made letter in PDF and insert the address and name by self. Put the letter in envelop and send by speed post. Many letters will be received by PMO, MSJE and Chief Minister offices and Social Welfare Departments! You keep a copy with yourself and can decide to send to NAD or not. Big pile of letters will gather quickly. Seeing so many letters. hoping that Government agrees to recognise 23rd September as International Day of Sign Languages. This year we get the approval. I request you all to support this. Further, I tell you that you can contact Member of Parliament (MP) in your states. Meet the MP and request their support. We will meet the Government official again and show them the many letters. Then the Government will finally accept and give approval soon. National Association of the Deaf team was invited for the one day Sign Language Sensitization Program, organized by Delhi Police, on sign language and deaf. It was held at the Specialized Training Center, Rajendra Nagar Police Station, New Delhi on 22nd February 2018. The program was attended by around 50 police officials, including constables to ASI. Mr. Anuj Jain, Executive Director of NAD started the session by sharing the knowledge about sign language and how to identify a deaf person by seeing them signing and the sign for ‘deaf’ that is pointing index finger first to the ear then on mouth. He imparted practical knowledge to the people present there and conducted basic sign language class. Ms. Sonia Bhatia, Member of NAD also accompanied Mr. Jain and enacted various scenarios depicting situations with deaf person and police officials. Mr. Shivoy Sharma, Interpreter of NAD was part of acts where the role of interpreters was shown and how to deal in situations where interpreters were not present or difficult to arrange, by written communication or using visual cues. Everyone was on the same page and similar voices echoed on the importance of spreading awareness about sign language to other departments too so that the grievances, complaints and problems of the deaf people can also be taken up without any hassle and for smooth communication. Accenture invited Mr. Anuj Jain, Executive Director, NAD at their Gurgaon Office, Haryana in Cyber Hub as part of their Diversity Inclusion Program on 21st February 2018 . Mr. Jain was accompanied by Ms. Sonia Bhatia, Member, NAD and Mr. Shivoy Sharma, Sign Language Interpreter. The session was broadcasted through a Skype group call to all the Accenture business centers in India, the participants were around 250 Accenture employees. Mr. Sanjay Dawar, MD – Accenture Strategy, India gave a brief introduction about how since 2010 Accenture has been working towards an inclusive and barrier free work environment, and welcomed Mr. Anuj Jain who took over and he told about his personal life and the challenges that he faced while growing up from not allowed to use sign language openly, no proper access to education. Mr. Jain also told about how he overcame those challenges of sign language stigma and family issues; the importance of sign language for accessibility and in communication for a deaf person. Ms. Sonia Bhatia took a short basic sign language class over the conference video call which included the alphabets, days, months and numbers in Indian sign language. At the end the participants were delighted and inspired from the session. There were many questions asked to Mr. Anuj Jain: why isn’t there any unified sign language to which Mr. Jain replied that just like spoken languages, there are different sign languages all over the world and it is as equal to any other language having its own grammar and syntax. One more question was asked about the etiquettes while meeting a deaf person – to look at the deaf person and not the interpreter and understanding the sign for ‘deaf’ when the hearing person meets them. Three years after the first sign language workshop for the resource persons & special teachers, Mr. Anuj Jain, Executive Director of NAD along with Mr. Shivoy Sharma , Interpreter trained about 50 Hearing Teachers working under Sarva Shiksha Abhiyan on Indian Sign Language for 2 days. Mr. T. R. Mangotra, State Coordinator IE, Sarva Shiksha Abhiyan, Jammu &Kashmir had requested for a higher level than last time in which they were taught more new signs, how to express and explain concepts, importance of body gestures and expressions. The participant teachers were from different districts of Jammu & Kashmir who are working under Sarva Shiksha Abhiyan, Jammu &Kashmir as resource persons. The knowledge that they gained from the two day workshop will help them further impart and share that with their deaf students. Along with that, various activities were held during the workshop like diving the teachers into groups and each group was given a picture and they had to come up with the explanation of the picture in sign language; they were given 2-3 words and had to put them into use in one on one conversation using sign language; describing and explaining a word without using its sign. Good News from NAD India that Minister for Information and Broadcasting approved that Doordarshan has arranged the accessible telecast on the sign language interpreter for Hon'ble President of India's speech on the eve of the Republic Day on 25th January 2018 at 630pm to 7pm or 7pm to 730pm on DD Bharti TV & the Republic Day on 26th January 2018 at 830am to onwards on DD News TV & DD Bharti TV. Please share it with anyone. With regards from NAD India. I am the President of the National Association of the Deaf, India. I am very happy that the World Federation of the Deaf has been advocating with Antigua and Barbuda. It's in the southern coast of USA. WFD and Antigua & Barbuda, worked together requesting the United Nations, UN in New York for the International Day of Sign Languages. The UN accepted the proposal but said that they will need approval from all member Countries. So all the officials came at the UN assembly and question was raised that they agree with having an International Day of Sign Languages. It will be observed on 23 September every year. The assembly agreed and accepted the proposal on 18 December 2017. Why they chose 23 September? Because the World Federation of the Deaf held its first conference in Italy on September 23. Now every year on 23 September International Day of Sign Languages will be celebrated. We are proud and congratulate Mr. Colin Allen (President, WFD). Plus, the people from WFD who worked hard and pushed for International Day of Sign Languages to be approved by UN. This year 2018 will be the first time on 23 September all over the world International Day of Sign Languages will be celebrated. We are proud and congratulate them again. For more Information and Photos. International Week of the Deaf "Full Inclusion with Sign Language"
Indian Sign Language Research & Training Centre, Ministry for Social Justice & Empowered organised the National Conference on Empowering Deaf through Sign Language between 20th to 21st March 2017 at Vigyan Bhawan, New Delhi. Inaugurated by Shri Thaawarchand Gehlot - Minister for Social Justice and Empowerment. Other reputed names include Shri Krishan Pal Gurjar - Minister of State for Social Justice & Empowerment, Shri N.S Kang - Secretary, DEPwD, Dr Kamlesh Kumar Pandey, Chief Commissioner of Disability and Shri Awanish Kumar Awasthi - Joint Secretary, DEPwD. Indian Sign Language Research & Training Centre, Ministry for Social Justice & Empowerment has partnered with Sai Swayam Society, National Association of the Deaf, Deaf Enabled Foundation, All India Foundation of Deaf Women, Indian Sign Language Interpreters Association and Association of Sign Language Interpreters. Warm greetings from ISLRTC, New Delhi! It gives us immense pleasure to bring to your kind notice that Indian Sign Language Research and Training Centre (ISLRTC), New Delhi under Department of Empowerment of Persons with Disability, Ministry of Social Justice and Empowerment, Govt. of India is organizing a two-day national conference on “Empowering Deaf through Indian Sign Language” on 20th -21st March, 2017. We are happy to invite you for the conference. Please forward this mail to all your colleagues in your institute and all others who are in touch with you from our field for wider circulation. Brochure of the National Conference and the registration form is attached herewith for your reference. You can send the scanned copy of the registration form duly filled in to the email id: islrtcnationalconference@gmail.com or through post to the address given on the top of the registration form. National Association of the Deaf Team joined Mrs. Diana Lil Philips (Asst. Professor) from Amity University, Noida addressing the 100 hearing students, professors and staff from Amity University, Noida on 16th February, 2017 at Amity University, Noida. The response was tremendous. The 100 hearing students, professors and staff of Amity University, Noida are keen to implement certain changes in their working. They are willing to include Indian Sign Language as part of their training module to enable hearing students to interact with deaf people who approach them. Mrs. Diana Lil Philips (Asst. Professor), Amity University, Noida hopes for active participation from National Association of the Deaf in the student project on Sign Language in formulating this training module. The program was organized by Amity University, Noida and around 100 hearing students, professors and staff had attended the event. Mr. Anuj Jain (Project Director), National Association of the Deaf had given the presentation about Awareness for the Deaf to 100 hearing students, professors and staff of Amity University, Noida. Mr. Shashi Kant (Supervisor), Ms. Sonia Bhatia (Program Officer), Mrs. Ritu Panda (Volunteer), Mr. Raj Kumar Jain (Volunteer), Mr. Shivoy Sharma (Interpreter) & Ms. Sarah Sharma (Interpreter) of National Association of the Deaf taught the very basics of Sign Language to 100 hearing students, professors and staff. This Sign Language Class sent a powerful message on the importance of promotion of Indian Sign language to Professors, Staff and Students of Amity University, Noida. Dr. Jayanti Pujari, Director of Amity Institute of Rehablitation Science, Amity University, Noida gave the 5 gifts of Tulsi Pots to Mr. Anuj Jain, Mr. Shashi Kant, Mr. Raj Kumar Jain, Ms. Sonia Bhatia and Mrs. Ritu Panda. Dr. Jayanti Pujari, Director of Amity Institute of Rehablitation Science said she would like to work together with the NAD to conduct the Sign Language Program for Students of Amity University in the future. They were interested in learning the Sign Language and spread awareness about it. They hope to also help the deaf communities in India. We successfully for the 6th National Deaf Conference 2016 being held at Indian Social Institute, New Delhi between 20th to 21st February, 2016. We have many deaf lecturers signing to the 200 deaf delegates from all over the country participating in the 6th National Deaf Conference 2016. The conference started with the welcome note by Mr. A. S. Narayanan, Secretary of NAD. Mr. T. K. M. Sandeep, CEO, & Mr. Hari Hara Kumar, Director Education, Deaf Enabled Foundation, “Technology on Education for the Deaf”. Mr. Sharique Khan, Ms. Deepna Sonani& Mr. Adnan Khan, Qugo, “Chat with Animations”. Ms. Shilpi Kedia, Managing Director, BarrierBreak Technologies, Mumbai. Mrs. Preeti Saini, General Secretary, Association of Sign Language Interpreters, “ISL interpreter for Deaf Community in India”. Mr. Gyanendra Purohit, Founder, Anand Deaf School, “ISL Bill and Including Recognition Official Language”. Mr. Aqil Chinoy, Founder & CEO, Inspiralive, “Technology for the Deaf”. Mr. Rajesh Ketkar, Assistant Director, Ishara Foundation, “Accessibility on Video”. Mr. Sunil Sahasrabudhe, ISL Teacher for NIHH & Mr. Mohd.Shafique, ISL Teacher for NIHH. 11. Mr. Sachin Singh, Teacher, DSMNRU, “Technology & Accessibility”. Mr. K. C. Isaac, Founder & President, Kerala Association of the Deaf, “History of Deaf People” in India. Mr. A.S. Narayanan, Secretary, NAD, & Mr. Zorin Singha, President, NAD, “RPWD Bill, ISLRTC & Driving License for the Deaf”. Mr. Anuj Jain, Joint Secretary of NAD The programs were a great success and a great source of encouragement and inspiration to all our 200 deaf delegates from Delhi, Chandigarh, Mumbai, Kerala, Chennai, Haryana, Rajasthan, Madhya Pradesh, Gujarat, Uttrakhand, Uttar Pradesh, and other parts of India participated in the Conference. It has benefited a lot for deaf delegates learning about 13 deaf lecturers’s presentations. They are very impressed by our Conference. NCPEDP invited Asha Singha (Interpreter) and Zorin Singha, President of NAD to give lecture to 25 Employees of Hans Foundation about history of NAD at India Habitat Centre, Lodi Road, New Delhi on 17th November, 2015. Mr. Anuj Jain, Joint Secretary of NAD was also invited to teach the Indian Sign Language classes to 25 Employees of Hans Foundation for two days on 17-18 November 2015 at the same location. The following document comes from the Ministry of Social Justice and Empowerment Government of India - published. NAD receives the letter from the President of World Federation of the Deaf congraulating NAD for its success in obtaining the Government of India's approval for setting up of ISLRTC as an autonomous body. Shri Yogesh Kumar, Public Relation Officer of NAD with Interpreter Babli met Shri Satya Jain, Ex-MP of Chandigarh on 11th September, 2015. They spoke to Shri Satya Jain that they needed his help for demanding the ISLRTC as an autonomous body. He said he will send the letter to Cabinet Secretariat for approval the ISLRTC as an autonomous body immediately after meeting with the Prime Minister of India Shri Narendra Modi. Shri Yogesh Kumar, Public Relation Officer of NAD with Interpreter Babli met Shri Balramji Dass, Governor of Chhattisgarh, Shri Surjit Kumar Jayani, Minister for Health, Govt. of Punjab, Shri Vijay Dev, Advisor to Administration of Chandigarh, Smt. Kirron Ker, MP of Chandigarh and Shri Sanjay Tandon, President of BJP, Chandigarh on 10th September, 2015. They spoke to all of them that they needed their help for demanding the ISLRTC as an autonomous body. They said they will speak to the Prime Minister of India Shri Narendra Modi for demanding the ISLRTC as an autonomous body after the Cabinet Secretariat approval immediately. Shri A.S.Narayanan, Secretary of NAD, Shri Anuj, Joint Secretary of NAD, Smt. Geeta Sharma, Woman Secretary of NAD and Ms. Riya Taneja, Interpreter met Shri Amit Shah, President of BJP. Shri Amit Shah is a very nice person and would tell Shri Narendra Modi, Hon'ble Prime Minister of India, about ISLRTC as an autonomous body must be approved by the Cabinet as soon as possible. The ISLRTC Now campaign is gaining momentum. A petition on Change.org has been created and we are looking for friends , acquaintances to extend their support. Since we focus on accessibility we have translated the text of the petition into ISL for the Indian Deaf Community. It is a request to family, friends , Deaf friends and society at large to extend your support. Indian Sign Language and its Users cannot be ignored. If we talk of an Inclusive Society for all we need to make sure there is Accessibility in all forms. The Indian Deaf Community needs YOUR SUPPORT. Shri Yogesh Kumar, Public Relation Officer of NAD with Interpreter Babli visited the residence of Smt. Kirron Kher, MP of Chandigarh on 25th August, 2015. They spoke to Smt. Kirron Kher that they needed her help for demanding the ISLRTC as an autonomous body. She said she will speak to the Prime Minister of India Shri Narendra Modi for demanding the ISLRTC as an autonomous body. 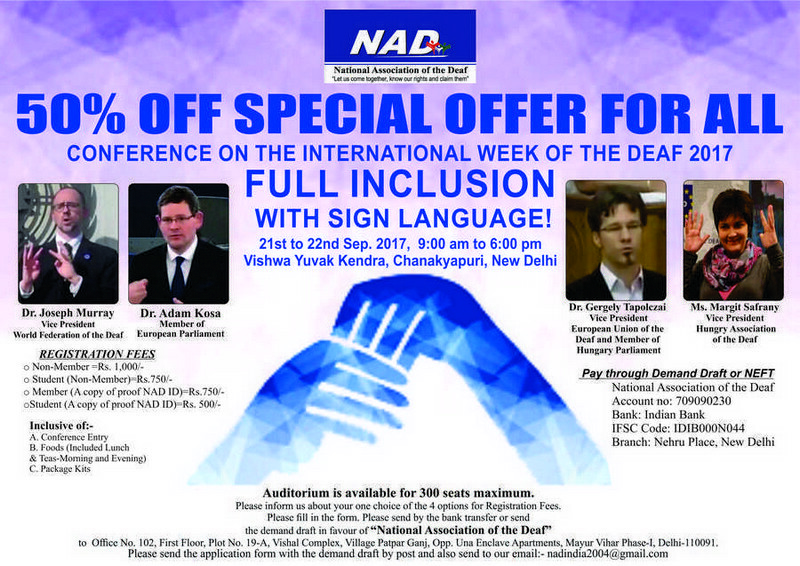 Shri A. S. Narayanan, Secretary, Shri Anuj Jain, Joint Secretary of National Associaiton of the Deaf and Smt. Uma Kapoor, General Secretary of All India Foundation of Deaf Women visited the residence of Shri Ram Jethmalani, Senior Advocate on 25th July, 2015. We spoke to Shri Ram Jethmalani that we needed his help for demanding the ISLRTC as an autonomous body. He said we should make request letter for demanding the ISLRTC as an autonomous. He will tell Shri Arun Jaitley, Finance Minster. He fully supported us. We thanked greatly to Smt. Uma Kapoor, General Secretary of AIFDW led us to meet Shri Ram Jethmalani. Shri Zorin Singha, President, Shri Anuj Jain, Joint Secretary of National Associaiton of the Deaf with NAD Members visited the residence of Shri Thaawar Chand Gehlot, Hon’ble Minister for Social Justice and Empowerment early morning on 6th July, 2015. They spoke to Shri Thaawar Chand Gehlot that we, the deaf people in India, needed his help for demanding the ISLRTC as an autonomous body. He said he had already spoken to Dr. Jitendra Singh, PMO regarding ISLRTC. They requested him to encourage Dr. Jitendra to approve the ISLRTC as an autonomous body. He said he would do it surely. He asked them how to learn the sign language. They taught him the alphabetic and words sign language. He was very inspired to learn it. He spent 45 minutes learning sign language from them. It was a very wonderful experience with Shri Thaawar Chand Gehlot, Hon’ble Minister for Social Justice & Empowerment, being a very kind and understanding person. The Union Minister of State (Independent Charge) for Development of North Eastern Region (DONER), MOS PMO, Personnel, Public Grievances, Pensions, Atomic Energy and Space, Dr. Jitendra Singh has said here today that the Government will sympathetically consider setting up "Indian Sign Language Research & Training Centre" as an independent body for the benefit of those suffering from impaired hearing. He was talking to a delegation of National Association of the Deaf (NAD) led by its Secretary, Shri A.S. Narayanan, who requested for withdrawal of the order placing the proposed Indian Sign Language Research Training Centre under Ali Yavar Jung National Institute for the Hearing Handicapped (AYJNIHH). They demanded that the proposed autonomous institute for sign language research and training should, instead of being placed under another institute, be managed by concerned experts dealing with hearing impairment as well as by representatives of the Association of the deaf. Dr. Jitendra Singh said, he has understood the contention expressed by the representatives of NAD that Ali Yavar Jung National Institute for the Hearing Handicapped deals more with therapeutic management like cochlear implant, etc., to restore hearing and may not be actually imparting the non-pharmaceutical training like sign language, etc. He would, therefore, take up the issue and try to find a way out, he said. The Honorable Minister of State for Prime Minister's Office Dr. Rajendra Singh met with the same delegation which met the Minister of Social Justice on 5th. Dr. Singh gave us a very patient hearing and gave us very positive assurance. Dr. Singh who is a medical professor turned minister worked as a Professor of diabetic medicines before joining politics. His academic and medical background took no time to understand how critical it is to mix language with therapeautic and clinical services. the language of the text may look wired to west but for us Indians it is a long overdue outcome. I would like to tell you that Secretary of Department of Empowerment of PWD Sh. Lov Verma and Joint secretary Sh. A. K. Awasthi played an important role to brief the minister in a very positive way (while we were waiting on meeting table). Many thanks to the two friend of deaf people. On 5th after meeting the minister Secretary Sh. Lov Verma set with us for long and we did not miss this opportunity to talk him over various issues and about who deaf people are on the street. Shri Lov Verma had joined the ministry in February and had no background knowledge about the sign language users, deaf community, deaf culture. However after our talk and seeing the huge crowd he realised how valid is our demands. He seems to be a efficient man and we expect him to work with us from now on. The huge crowd was the first big help to force the Minister of social justice to leave parliament and meet us and promise us to take us to priminister office in 15 days but within 24 hours we got phone call to meet the Minister Dr. Singh. The chain of events and outcomes suggests that we worked very organised way for the first time with unity and vigour. Thank you all for your supports. Long live our team leader Shri A.S. Narayanan. We look forward to the official circular/order stating that our 3 demands are met and ISLRTC is officially autonomous. The Union Minister of State (Independent Charge) for Development of North Eastern Region (DoNER), MoS PMO, Personnel, Public Grievances, Pensions, Atomic Energy and Space, Dr. Jitendra Singh has said here today that the Government will sympathetically consider setting up Indian Sign Language Research & Training Centre as an independent body for the benefit of those suffering from impaired hearing. He was talking to a delegation of “National Association of the Deaf” (NAD) led by its Secretary, Shri A.S. Narayanan, who requested for withdrawal of the order placing the proposed Indian Sign Language Research & Training Centre under Ali Yavar Jung National Institute for the Hearing Handicapped (AYJNIHH). They demanded that the proposed autonomous institute for sign language research and training should, instead of being placed under another institute, be managed by concerned experts dealing with hearing impairment as well as by representatives of the Association of the deaf. MAHA PROTEST IN DELHI ON 5th MAY 2015 FOR DEMANDING THE ISLRTC AS AN AUTONOMOUS BODY. More than 5,000 deaf people from all over the country gathered with just one hope in their heart, that the ISLRTC is an autonomous boday and that the disabled citizens of India do not have to wait another 2 or 3 years to get the ISLRTC as an autonomous body. The Deaf Community in India is one step closer to getting autonomy for ISLRTC! The meeting with MSJE Minister Shri Gehlot, Secretary Shri Verma and other official resulted in a promise for a meeting the PM Modi within 15 days. All work on ISLRTC under NIHH will be stopped until then. Deaf Leaders are planning another demonstration on May 20 if Shri Narender Modi does not meet them or if their demands are not met. The great part was the media--TV and newspaper--they covered the news in a very positive way. We were posting clippings, links and clips later. Congratulations, NAD and other organizations that worked together. Part of the group from all over India that participated in the demonstration. Representatives of the group with Secretary Verma. Around 85 deaf participants came from all over India which included national deaf bodies like Mr. Zorin Singha (President of NAD), Mr. A. S. Narayanan (Secretary of NAD), Mr. Onkar Sharma (General Secretary of All India Federation of the Deaf), Mrs. Uma Kapoor (General Secretary of All India Foundation of Women Deaf), Mr. T. K. M. Sandeep (CEO of Deaf Enabled Foundation), Mr. Aqil (India Deaf Society), Mr. Sunil Sahasrabudhe (ISL Teacher), Mr. Sujit Sahasrabudhe ( ISL Researcher), Mr. Sibaji Panda (Lecturer of Uclan University UK), Dr. Madan Vasishta (PhD of Gallaudet University USA) & Dr. Surinder Randhawa (PhD & Professor of BAASLS). It was unanimous decision to demand for the autonomy of ISLRTC. We made them aware our strong disagreement with the Ministry of Social Justice and Empowerment’s decision to merge ISLRTC with NIHH. We asked them for their support to make ISLRTC a standalone, autonomous centre under the Ministry. We are writing this to seek your support in preventing a great injustice towards 10 million deaf citizens of India. Majority of our deaf countrymen use Indian Sign Language (ISL) as their primary mode of communication. ISL is an integral part of the lives of our deaf countrymen an women; it does more than transmit idea and encourage self-expression, it is grounded in their culture and their communities. Whereas in other countries, government are actively encouraging research in their respective singed languages, including prominent members of the sign language community in the process as well as providing support for interpreter training and access to higher education, our Indian government continues to suppress the use of ISL. This is also to bring to your kind notice that it was because of the advocacy led by National Association of the Deaf that the Indian Sign Language Research & Training Centre was put in the 11th Five Year Plan. NAD has from the beginning, demanded that this Institute should be an independent autonomous body. This also announced establishment of such a Centre in his Budget Speech for 2010-11. However, the MSJE ignored the input from Deaf Community and leaders and asked IGNOU to take over the project, which resulted in years of delays in implementing all the work proposed and approved by the governing and advisory committees. Additional transgressions include IGNOU’s liberal use of project funds despite not contributing to the project as well as reneging on their promise to provide land for buildings. Though there was much relief when MSJE finally took the ISLRTC out of IGNOU in 2013 in promise of establishing it as an autonomous body, that relief would be short-lived. After dragging its feet for over 18 months, the Ministry is taking a step that is proving to be worse than putting ISLRTC under IGNOU. It has decided to put the project under Ali Yavar Jung of the National Institute of Hearing Handicapped (NIHH) in New Delhi. On the surface it sounds logical, however, given the history of NIHH, the move is analogous to asking a wolf to raise a lamb. NIHH is strongly rooted in oral philosophy and all it has little more for ISL during its 32 years of existence than providing few ISL classes in few cities. We are sure that the entire budget allocated for developing ISL interpreters, training teachers in bilingual education of deaf children and involvement of Deaf people in making decision on their education and rehabilitation will be used in other areas. This is unacceptable and should not be condoned. The project goals and outputs that were approved in 2007 by 11th Five Year Plan have yet to be actualized and it is imperative that the process involves the right people. For example, When a centre to support a spoken language – say Sindhi – is established, it is NOT managed by people who are not Sindhi themselves or do not speak Sindhi. ISLRTC must be managed by people who use ISL and support it. Later in the day on 16th March, We held a press conference emphasizing the same demand at Indian Women’s press Corp. (Newspapers clipping enclosed). This event was organised by Sarva Sastha Abhiyan. NAD is very grateful to Sarva Sastha Abhiya for this valuable event. Anuj Jain (Joint Secretary), Sonia Bhatia, Rajesh Khandelwal & PinkeyKhandelwal (Sign Language Interpretation) of National Association of the Deaf (NAD) meets & congratulates BJP President, Rajnath Singh for his victory election for his MP on Saturday morning on 24th May, 2014 to request that the Prime Minister's Swearing In Ceremony on Monday, 26th May 2014 must feature sign language interpretation. BJP President listens intently as Anuj Jain explains his point regarding the importance of Sign Language for India's 18 million deaf citizens. A visibly pleased NAD delegation at the end of the meeting. We are told that orders have been issued and 3 Sign Language interpreters are being put on duty for the occasion. Mr. A.S. Narayanan, Secretary, Mrs. Geeta Sharma, Women Sectretary, Mr. Anuj Jain, Project Director and Ms. Angel Singha, Interpreter participated in Sign6, International Conference of Sign Language Users in Goa from 7th to 9th February 2013. This conference focuses on research on sign languages and deaf studies and a global scope is important for capacity building because Deaf communities are quite small in number in many countries. Mr. Narayanan was one of three plenary presenters. He talked on the genesis of Indian Sign Language Research and Training Centre. The Indian Deaf community fought hard to get ISLRTC on the 11th Five Year Plan Document. There had been so many rallies, protests and meetings to bring this paper to life. And, on 4th October 2011, we had laid its foundation stone in IGNOU. This shows that slowly government is recognising Indian Sign Language and that day isn’t far when ISL would be one of the official languages of India. There were several sessions like sign language and linguistics, community, culture and deaf education and the status of the same in South Asia. The mode of communication throughout was International Sign Language and Indian Sign Language. We received exposure on the grammatical functions of the A-handshape & the I-handshape in Korean Sign Language, age-related sociolinguistic variation in sign languages with particular reference to Nepali Sign Language, rethinking established concepts in Deaf Studies and many more. There were several critical issues discussed like work on sign language endangerment with UNESCO and how to put deaf women’s needs in every policy especially violence against women. We were invited to the first foundation day of Indian Sign Language Research and Training Centre (ISLRTC) on 4th October 2012. The Director I/C of ISLRTC, Prof. A.K. Singh welcomed the paneled guests i.e., Shri Gopi Nath Pradhan, Vice-Chancellor of IGNOU, Dr. Madan Vasishta, Chief Advisor of ISLRTC, Shri A.S. Narayanan, Secretary of National Association of the Deaf (NAD), Shri Sibaji Panda, Lecturer of BAASLS and Dr. Hemlata, Coordinator of BAASLS and the friends of the Deaf Community and students. He invited the guests and two students to light the lamp to start the function. Before the Director asked Shri Pradhan to address the audience, he asked Dr. Vasishta and Shri Pradhan to present a laptop to a student of BAASLS whom the faculty found hard working, sincere, determined and with a bright future. Shri Pradhan thanked everyone for taking time out and being a part of ISLRTC’s first year of completion. Soon, the advertisement for posts at ISLRTC will be out and we will have experienced staff and faculty along with the sanction by the Ministry of the construction of the ISLRTC building. The dreams of the deaf community will be coming to life and taking shape. Prof. Singh then invited Shri Narayanan to share his journey. He journeyed through the time when ISLRTC was only a seed of thought, a dream. Many years ago, NAD had started to demand from the Government for a research and training centre of Indian Sign Language. NAD went to various offices of MSJE and MHRD and met with all the high officials in the Planning Commission (PC) to explain the needs of the Deaf community and they were given promises that ‘something will be done’ but no action had been taken. Finally, the 11th Five-Year Plan had an entire chapter on disability. That Plan mandated the setting up of a Sign Language Research and Training Centre, a National Captioning Centre, at least one residential school up to class XII for deaf students in every state and one degree college in every zone, among other things. But, more than two years after the Plan came into force and the implementation had been zero. Then, NAD demonstrated against this delay. The Deputy Chairman of PC talked to the PM and later met with Shri Mukul Wasnik, Minister of SJ&E, who started the process which led to the final establishment of ISLRTC on 4th October 2011. He couldn’t believe that one year had passed. ISLRTC was and is the result of the hardwork of thousands of deaf people. All of them came out in the streets to demand for the right to use their mother tongue. NAD is thankful to the Government for establishing ISLRTC last year. This is only a beginning. Soon, ISLRTC branches will be all over India. ISL classes will be in towns and villages and all the schools will use ISL for deaf students. All teachers of deaf students will use ISL. This will make communication and learning by deaf children easier. This will also lead to more interpreters. We need 4 lakh interpreters but have only 200 now. New training programmes will help produce quality and proficient interpreters. It will take time but one day, we will have enough qualified interpreters to meet our need. We will have excellent professors and researchers who will research on ISL. We will know more about our language. We must work together to make sure our rights are preserved. ISLRTC has done some good work in the last year and we hope that it does much more in the coming years. The Deaf community must constantly provide its support to ISLRTC. Prof. Singh said that never had he ever thought that he would be a part of the Deaf community in any way and now he is and he has never enjoyed more than being a part of this community. This vision will be real soon with the constant guidance of Dr. Vasishta and Shri Narayanan, people who talk less but work a lot unlike the professors who talk a lot but work less. Dr. Madan Vashista mentioned that if it weren't for the advocacy of National Association of the Deaf, we wouldn't even be having ISLRTC in the first place. Without ISLRTC, we cannot teach ISL or even train the hearing teachers of deaf schools or having a state level workshop of sign language interpreters or educate parents about the needs of a deaf child and link them to organisations that can assist in the child's upbringing. Shri Sibaji Panda shared the same views as Dr. Vashista. He requested the deaf community to constantly give its support to NAD who truly fights for the needs of the Deaf community and is extremely proactive in its work. As for ISLRTC, since it has taken BAASLS under its wings, we hope to be able to reach the students that are unreachable using IGNOU's networks and BAASLS can have more students in the coming years. The ceremony ended with students dance performances, skits and jokes showing the culture of the Deaf community.